We welcome applications from individuals employed by organisations delivering social work services; the 8 schools of social work; CELCIS and the Centre for Youth and Criminal Justice. Individuals can either be a Full Member (if you are a senior leader); or an Associate Member (if you are aspiring to be a senior leader). If you are an organisation delivering social work services or with a significant focus on social work services, you can take out a Corporate Membership, giving your staff access to our Practice Networks. If you work freelance and are a registered social worker, you can join as a Consultant Member. Former members who have retired can be Honorary Members. Full – £100 per annum. For people in senior management roles in organisations directly involved in the provision of social work services and for academics in the eight Scottish Schools of Social Work, the two centres of excellence (CELCIS and CYCJ) and IRISS. Corporate – £500 – £3,000 per annum depending on size. For organisations directly involved in the provision of social work services. Or for those with a primary focus on social work service, but who do not actually deliver services to people. This level of membership allows, amongst other things, access for your staff to Practice Networks and Social Work Scotland events. Associate – £25 per annum. For people working in organisations directly involved in the provision of social work services and for academics in the eight Scottish Schools of Social Work, the two centres of excellence (CELCIS and CYCJ) and IRISS, who are not as yet at senior management level. Consultant – £100 per annum. For people who are registered social workers working as independent consultants. Honorary – £75 per annum. You are applying to become a member of Social Work Scotland. By clicking Apply, you undertake to accept the rules and regulations in accordance with its Code of Conduct. 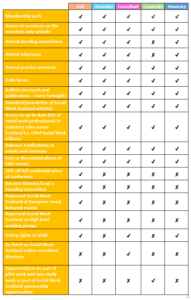 Social Work Scotland has the right to reject or suspend my membership in accordance with the organisation’s Articles of Association. We will contact you on receipt of this form to advise you of how to pay your membership fee.